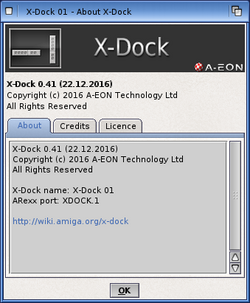 X-Dock is a new dock application for the Amiga. It is part of the Enhancer Software package for AmigaOS. 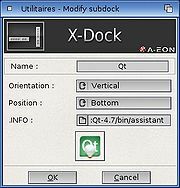 The application allows single or multiple docks to be created and placed on the Workbench Screen with each containing icons for applications, scripts or even directories (drawers). 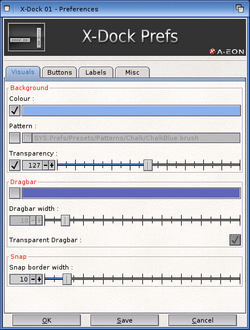 Docks can be customised in visual look and appearance by the user with orientation, position, different colours, transparency levels, rounded corners, highlighted edges and label fonts. When a dock is locked, the dock cannot be changed and icons cannot be added. 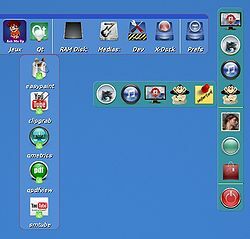 The dock can be locked or unlocked by using the Lock checkbox option in the menu or the Amiga-C keys. Once unlocked, icons can be dragged and dropped over the dock to add them or alternatively the buttons tab in the X-Dock Preferences can be used to manage the icons on the dock. This includes adding, removing and arrange the order of icons as well as adding separators between icon groups. If a dock is locked and an icon from the Workbench is dragged and dropped over an icon on the dock, the dock application will try to open or process that file associated with the Workbench icon. For example if you have a text document you wish to open to edit, then you could drag it and drop it over the MultiEdit icon. MultiEdit will then open and automatically load that document file. Multiple files dropping is additionally supported: for example, you can drop multiple picture files over Multiviewer to open them all. Unlocking a dock allows the user to move and modify it. 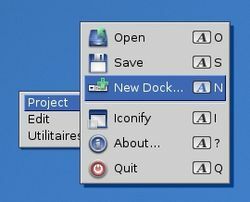 Unlocking a dock can be done through standard menu or PopupMenu (or Amiga-C keys). A quick unlock mode is available too by keeping Ctrl key pressed in locked mode. When unlocked, a red border will be displayed surrounding the dock if Borders Unlock option is activated in the X-Dock Preferences Misc tab. subdock button: button that opens a subdock when pressed. This button is created by using Insert subdock Popup menu option in an unlocked Dock. Drawer/Volume buttons have a special feature. In Locked mode, if you drop file(s) or drawer(s) on it, the element(s) will be copied in the destination. If the element still exists in destination location, a confirmation requester will be displayed. 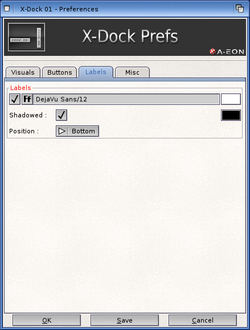 At end of the copy, the destination drawer is opened with copied file selected. Two different menus are displayable in X-Dock, a standard menu and a PopupMenu one. 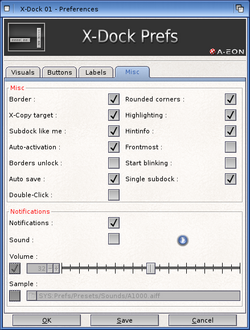 When Right-Mouse-Button (RMB) is pressed outside of X-Dock window, the standard menu is opened. When RMB is pressed inside X-Dock window, a PopupMenu is opened. Quit: Quit ALL opened X-Dock not only the current one. Dragbar: Display/hide dragbar. 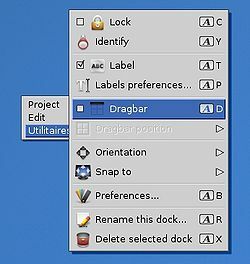 Dragbar can be used to move the Dock in Unlocked mode. When Dragbar is inactive, Dock can be moved using middle mouse button. Snap To: Choose to snap or unsnap the position of the Dock and the snapped position. Delete selected dock: Delete this Dock. The first Dock cannot be deleted. Remove all: Remove all the elements. Insert subdock: Open the “Add subdock” window to insert a Subdock before or after the current element. Modify button: Modify the current element. If the current element is a standard button, not a subdock, the “Modify button” window is opened. If the current element is a subdock button, the Modify subdock window is opened. Whilst the dock is in unlock mode, hover the mouse pointer over the icon you wish to move to a new location on the dock so that it is highlighted. Hold down the Shift key and the mouse pointer will change to a hand icon. Keep the Shift key depressed and click the left mouse button (but do not release). Move the mouse pointer to the new location that you wish the icon to be moved to and release the Shift key and left mouse button. The dock will be redrawn with the icon in the new location. NAME return name of the program "X-Dock"
VERSION	return version number "0.33 (10.04.2016)"
ADD [index_num program_name] icon_name program_label start_mode icon_selected_name"
Add a program at specified index. index_num and program_name are both required. ADD "5 SYS:Utilities/MultiEdit/MultiEdit.info MultiEdit WB DUMMY"
See X-Dock.rx for a ARexx sample. This page was last modified on 27 December 2016, at 00:05. This page has been accessed 77,024 times.